As a spirit animal, the wolf symbolizes instinct, intelligence, and ingenuity. A wolf sighting is a reminder to rely on our instincts and to trust our intuitive abilities. Wolves mirror our need to sometimes separate ourselves from the pack. It’s important to be self-reliant, but we also need to recognize the importance of family and social bonds. If the wolf is your totem animal, you have a deep connection with nature and you are a freedom seeker. What does the wolf know that you don’t? Speak to a life path psychic and find out what changes are coming your way! 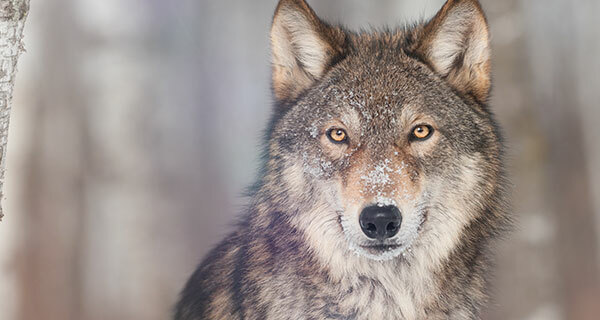 Like humans, wolves are unique in appearance and demeanor. Wolves are sensitive and loving with their pack members who each have distinct personalities. They also have an intricate language they use to communicate through various vocalizations and body language. They have actual rituals and hold certain territories as sacred ground. The pack lives as a large family with an alpha male and female who look out for their well-being. In times of hardship, only the alphas will mate, but the whole pack will care for them as their own. The wolf is a highly misunderstood creature. In fact, without knowing much about them other than their predatory behavior, wolves were sought after for sport, for furs, and for pure elimination purposes throughout the 19th and early 20th centuries in Europe and North America. It was a sad reminder that humans often fear what we don’t understand. This is yet another spiritual message the wolf brings. During the early 1920s wolves reached near extinction. In Yellowstone National Park, this elimination caused drastic and unpredicted damage to the ecosystem. Every animal, every grazing field, and even various waterways felt the impact. Nearly 70 years later in the 1990s, the U.S. took wolves from Canada and reintroduced them to Yellowstone, and the ecosystem began to thrive once again. Of course, wolves hunt prey to eat, but in doing so, they maintain a delicate balance in nature. Their reintroduction to the wild pushed back other populations that were growing out of proportion to their environment, while also allowing the animals most suffering from this imbalance to come back and resume the natural order of things. Now that the wolf is no longer on the Endangered Species List, their numbers in states like Idaho, Wyoming, and Montana, are again dwindling. Generally speaking, spirit animals bring us messages from the spirit world. These messages can come in the form of an animal sighting or in a dream. In our dreams, one of the things that wolves symbolize is our need for survival through self-confidence. Running from a wolf in a dream can indicate a need to confront problems and to face your fears instead of hiding from them. On a positive note, the wolf represents a reliance on intuition and our deep connection to both the physical and spiritual worlds. Negatively, the meaning of a wolf sighting may bring awareness to our inability to trust our own intuition or indicate a lack of trust in the people in our lives. Generally speaking, for the tribes who hunt, the wolf is the great hunter and guide. He is also seen as a shapeshifter and a trickster (like the coyote and fox) mostly because he can adapt to the various places he travels—such as paths deep in the woods. His instinctive abilities help him become one with his environment. This was an important trait for warriors and hunters to have in order to be successful in their endeavors, especially when it led them into unexplored territory. If you are lucky enough to have a wolf sighting, trust your instincts and be aware that you are in the presence of a magical, spiritual creature that very much mirrors your own existence. The other day I came home and my daughters dog had jumped from my bed knocked over table to kill her 2 much loved cockteils and killed them what does this mean birds and death? Dear Kathleen: So sorry to hear about your birds – I cannot answer that question in this venue, you really should speak to a psychic who can tune in on the incident. My condolences.